We try to accommodate for all of our patients needs. Reading through the information on our appointment system will help us, help you. Our standard consultation time with a Doctor is 15 minutes and is appropriate when only one problem needs to be addressed. If you feel more time with the Doctor is required, please inform the receptionist upon booking. Pap Smears, Skin Checks, Mental Health Care Plans, Surgical Procedures, and Medicals will require an extended appointment, you should inform the receptionist upon booking. If you are unable to attend an appointment, please notify the practice as soon as possible. Failure to notify the practice may incur a non-refundable fee of $40 per appointment which must be paid prior to making any further bookings with our Doctors. Please inform reception staff if your matter is urgent. We are trained to triage your healthcare needs and to accommodate you in the safest way possible. Home visits are at the discretion of the Doctor. They are only available to existing patients of the practice, who live locally to the clinic. Home visits are pre-arranged with the Doctors and are conducted during surgery hours. Each of these are legal documents. As such, they will not be written over the phone and all Doctors require you to make an appointment to obtain these. A consultation with the Doctor is required to receive and discuss any pathology results, and plan any further management. Patients will be contacted by phone if a follow-up appointment is required. Unless you request otherwise, we may place you on a recall list for preventive health checks, such as Pap Smears, Diabetes and Heart Disease care, annual Health Assessments, and other advisable checks. Doctors are able to take calls when the time permits. 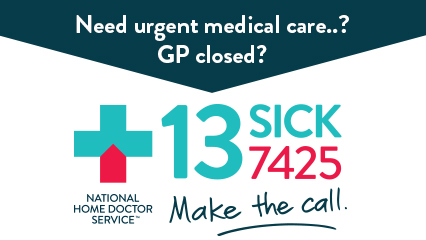 If the Doctor is not available, a message will be taken and your call will be returned as soon as possible. Calamvale Family Practice is a mixed billing practice. All patients without a Pension Card or Healthcare Card will incur a fee. Students who present their student ID cards are eligible for discounted consultations. Mental Health Care Plans & Consultations are not Bulk Billed and will incur an additional fee. Please contact the practice for further details. Calamvale Family Practice can offer you your Medicare rebate on the spot. Please bring your EFTPOS cheque or savings account card with you to access to this function. Private fees apply for Saturday appointments, unless the appointment is for a child.